"Historical Happenings" is the Newsletter of the Casterton & District Historical Society, Victoria, Australia, and copies are available for downloading by clicking on the relevant links below. The newsletters are in either WORD (doc) or ADOBE (pdf) format. NOTE - some of these files are quite large. 2015, October - New Committee ; Casterton Memories - Gordon Malee. 2015, August-September - Jack "The Shingler" Richardson - Jim Kent ; Archival Access Victoria - New Will & Probate Records ; Podcasts ; Random House Research. 2015, June-July - Our Aging Community - Jim Kent ; Casterton & District Historical Railway Station. 2015, May - "Fighting Hills Massacre" KONONGWOOTONG GUNDIDJ CLAN OF JARDWADJALI COUNTRY. 2015, April -"A Few Thoughts" - Jim Kent ; "Battle to Farm" - New Soldier Settlement Website ; Wando Vale Post Office - "Casterton News" Feb. 8th, 1957. 2015, March -"Thoughts on Mr Hall's Diary" - Jim Kent ; "Regarding the Minutes of 1968" - Jim Kent ; Archival Access Victoria. 2015, Jan./Feb. - Settlement of "Kaladbro" (Part 3 of 3) : "Williamstown Chronicle" ; 1968 Minutes of the Casterton Historical Society ; No-Knead Bread Recipe. 2014, December - Settlement of "Kaladbro" (Part 2) : "Williamstown Chronicle" ; "Having a Whale of a Time" - Jim Kent. 2014, November - Settlement of "Kaladbro" (Part 1) : "Williamstown Chronicle" ; "Bills Water Troughs" (a little more). 2014, October - "Places of Interest" : by Jim Kent ; "Murndal" ; Casterton Historical Society Minutes 1966. 2014, September - "To Be or Not to Be Divided" : by Jim Kent ; "The Bills Water Troughs" by Jim Kent". 2014, August - "The Mysterious Deaths of Four Children" : by Noel Norris ; Archives: MINUTES CDHS 1966 ; Visit to "Murndal". 2014, June-July - "Chatsworth House on the Hopkins" : by Jim Kent ; Archives: MINUTES CDHS 1966-68. 2014, May - "A Tretise on Harrow" : by Jim Kent ; "Stephen Henty and my Great Great Grandfather" : by Ros Coventry ; In Memoriam: Deborah Rogers (1938-30th April 2014). 2014, April - "Accidents Waiting to Happen" : by Jim Kent ; CDHS Minutes: 17th February 1966. First Meeting. 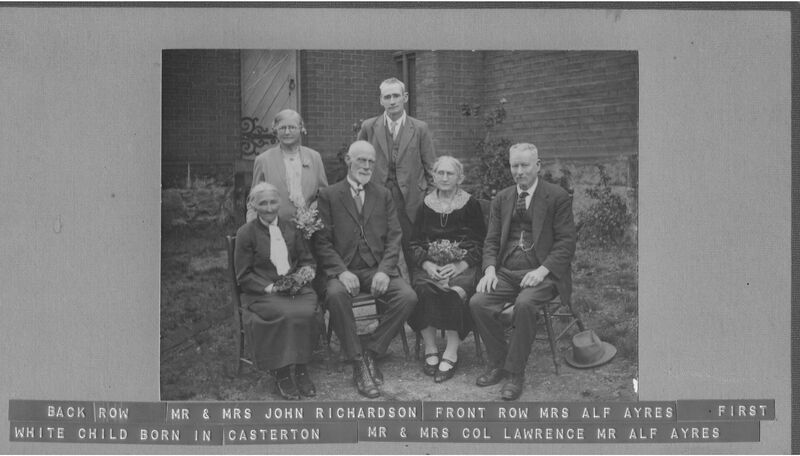 2014, February - "Teaching the three R's in Casterton" : by Jim Kent ; Minutes of CDHS meetings from 1966, 17th Feb 1966 ; Archival Access Victoria : Introducing 'House History Victoria'. 2014, January - "The Early History of Sandford" : as told by Mrs Grogan (cont.) ; Minutes of CDHS meetings from 1968 ; Back in the 16th Century. 2013, December - "Mrs Ida Pfeiffer : Pioneer Travelling Lady" ; "The Early History of Sandford" : as told by Mrs Grogan ; "Back in the 16th century : Dead Ringers". 2013, November - "The Story of a Sandford Store" - James Kent ; Launch of Kent's Corner "Roamin' 'Round the Town," Vol. 2. ; Casterton Historical Society 50th Anniversary 2014 ; Mount Burr Excursion. 2013, October - "A Tale of Two Graves" - James Kent ; "Soldiers' Memorial Avenue : Start made at Casterton." from "The Casterton News" : Thurs, 22nd August 1918. 2013, September - "Vintage cars and Weddings" - James Kent ; "The Marks of Mystery" - James Kent. 2013, August - "Place Names Around the Casterton District" - James Kent. 2013, June-July - "The Bakers of Casterton" - James Kent ; Extracts from "The Casterton News." 2013, May - "All that Glitters" - Jim Kent ; "A Minute Piece of Paper" - Jim Kent. 2013, April - "Tombstones in the Casterton New Cemetery" - Jim Kent. 2013, March - "Headstone Symbols in Cemeteries" - Jim Kent. 2013, February - "The History of the Casterton Convent and the Angelus Bell" - Jim Kent. 2012, December - "The Story Behind the Shell Label" - Jim Kent; Reading History "The fatal Shore" by Robert Hughes. 2012, October - "A Brief History of the Casterton District" - Jim Kent; Obituary Mr Hugh Glancy 1908. 2012, August - "The Story Behind the Spirit of Ecstasy" - Jim Kent; Obituaries "Casterton News" George Yarra BILSTON 1916, Charles William KOCH 1943; AGM deatails. 2012, July - "The Old Goods Shed at Casterton" - Jim Kent; Reunion & Book launch: James Henry BALL descendants; Reunion of ship passenger descendants for the emigrant ship "Zes Gesusters" aka "Six Sisters" London to Geelong 1853. 2012, June - "Sobriquets" - Jim Kent; Reunion of ship passenger descendants for the emigrant ship "Zes Gesusters" aka "Six Sisters" London to Geelong 1853. 2012, May - "The Story of the Mechanics Institutes" - Jim Kent; National Library of Australia eNEWS. 2012, March - "Casterton, Motor Vehicles and the 1950s" - Ian Grace; "CASTERTON PEOPLE : THOMAS CAWKER (1836-1926)" ; "CASTERTON PEOPLE : SAMUEL JACKSON (1807-1876)"
2012, February - "What's in a Name" - Jim Kent ; "Tom Cue of Casterton" - Jim Foster ; Become a Public Record Office of Victoria Wiki Warrior - P.R.O.V..
2012, January - "Motorbikes of Casterton" - Jim Kent; "Car Clubs of Casterton" - Jim Kent; Become a Public Record Office of Victoria Wiki Warrior - P.R.O.V. 2011, December - featuring - "A Brew that Cheers" - Jim Kent; "Parkie" KIM and the KIM Family of Casterton - Doris Milward "Gleanings 1". 2011, November - featuring - "A Treatise on 'The Early Days'" - Jim Kent; "The Bakers of Casterton" - Jim Kent. 2011, October - featuring - "The Clothing Shops of Casterton" - Jim Kent; "The Footwear People of Henty Street" - Jim Kent. 2011, September - featuring - "The Skin Stores of Casterton" - Jim Kent; ; "The Sporting Use of Thoroughbred Horses" - Jim Kent). 2011, August - featuring - "The Grocer Shops of Casterton" - Jim Kent. 2011, July - featuring - "The Butcher Shops of Casterton" - Jim Kent; "Muntham" 1856-1862 (extracts from Cuthbert Fetherstonhaugh's 1917 book, "After Many Days"). 2011, June - featuring - "The Railway that Wasn't" - Jim Kent; "Muntham" 1856-1862 (extracts from Cuthbert Fetherstonhaugh's 1917 book, "After Many Days"). 2011, May - featuring - "The Tangles Past of Flax" - Jim Kent; "Muntham" 1856-1862 (extracts from Cuthbert Fetherstonhaugh's 1917 book, "After Many Days"). 2011, April - featuring - "A Duty of Care" - Jim Kent; Handbury Fellowship Project; New Magazine "Inside History"; Australian Silent Film Festival. 2011, March - featuring - "Crossroads of Casterton" - Jim Kent; New Magazine "Inside History"; On-line Australian Societies Support Group; Parramatta Female Factory. 2011, February - featuring - Place Names - Bahgallah; Society Outings; History of Street Names; History of the Postal Services in Casterton and Strathdownie. 2010, October - featuring - "John and Ann GRANT, Caledonian Union Hotel, Sandford" - Catherine Bell (Pt. 2). 2010, September - featuring - "John and Ann GRANT, Caledonian Union Hotel, Sandford" - Catherine Bell; "Historical Happenings stopped by a huge problem" - Jim Kent. 2010, August - featuring - AGM Wednesday, 18th August at Merino Pub Bistro 11.00 a.m.; "A Poem of Casterton, 1939" - Jim Kent; Bronze plaque from descendants of German village of Nieder-Weisel sent to Germany; Marysville Historical Society; Stuart Exhibition at Alice Springs, English heritage records online; British Library's newspaper archive being digitised. 2010, July - featuring - "A Poem of Casterton, 1939" - Jim Kent; Clarice Beckett, artistic genius and a daughter of Casterton - John Christian; July AGM change. 2010, June - featuring - "Monetry Banking in Casterton" - Jim Kent; 2010 ANZAC AWARDS: Peace Prize to John Basarin; Heritagecare in Casterton - Coordinator, Roger Southern. 2010, May - featuring - Light on the Hill at Casterton - Jim Kent; Joseph HUGILL found - report by Alison Fleming, USA, of her visit to Australia. 2010, April - featuring - Campbell's Cutting & Culvert - Jim Kent; Annual Dinner report; Strathdownie field trip report. 2010, March - featuring - "The Roll Call at Merino Downs" - Jack Cleary; Prahran Mechanics Institute $1000 History Prize. 2010, February - featuring - "The Dance Halls and Orchestras of Casterton" Part 3 - Jim Kent; Joseph HUGILL (information request); Calendar of Events. 2010, January - featuring - "The Dance Halls and Orchestras of Casterton" Part 2 - Jim Kent; proposed calendar of events for 2010. 2009, November - featuring - "The Dance Halls and Orchestras of Casterton" - Jim Kent; "Caupaul" Station, Dergholm; Casterton New Cemetery Mapping Project. 2009, October - featuring - "The Life of Dame Mary Gilmore" - Jim Kent [NOTE the following corrections to this article - "John Gilmore was my great uncle and I have quite a number of letters and documents pertaining to him. (1) He died from tuberculosis, not food poisoning. (2) William Gilmore was his uncle, not his brother. (3) Dame Mary died at 97 years of age, not 92 years. "]; Victorian History Week in October. 2009, September - featuring - "The Cinemas of Casterton" - Jim Kent; AGM results; "Descendants of German Immigrants" from Nieder-Weisel, Hessen, Germany. 2009, August - featuring - "The Power Station at Casterton", "Training for Volunteers of the Historical Society and the Visitor Information Center", "Do you have historical records, books or photographs at home?". 2009, July - featuring - "JEFFREY Bros. Cordial Factory", "Family History & Research", Cemetery Volunteers. 2009, June - featuring - "Cinema Pure Merino Fandango", "Life of Thomas E McEVOY". 2009, May - featuring Calling for Social History Stories: The Making of Modern Australia, new ABC Project. "A Salute to Our Mechanical Pioneers" by Jim Kent. Chetwynd trip report. 2009, April - featuring Fromelles Red Cross Records from WW1 and O. GILPIN Stores by Jim Kent. 2009, March - featuring MITCHELL family donate local parish maps, move to the Casterton Visitor Centre, Casterton Iron & Brass Foundry (Jim Kent) [Click & read David Grant's correction to the GRANT family mentioned in this story]. 2009, February - featuring Calendar of Events for 2009, obituary Mrs Annie JEFFREYS (nee COX) 1939. 2008, December - featuring Calendar of Events for 2009, Delamore William McKAY 1877-1958 (Journalist). 2008, November - featuring Catherine McPHERSON 1777-1889, lost in the bush near Digby in 1881, aged 104y. 2008, October - featuring the launch of the booklet "The Pioneer Suffragettes of Casterton & District". 2007, December - featuring the Henty area, Marching Girls 1957, story "Christmas at Sandy Ridge". 2007, October - featuring William Henry SCOTT 1881-1960, the KOCH family, Grassdale, Paschendale, Tahara, Tahara Bridge, Tahra West schools, 1957 Marching Girls. 2007, September - featuring the Sandford Bridge, Vern McCallum Photographic Exhibition, Wando Vale Post Office, BILSTON, NORRIS & TURLEY in the Chetwynd area. 2007, August - featuring Pte Tom STOCK (Boer War), Kooyang Culture. 2007, July - featuring Nareen district schools, "Memories of Carapook", Muntham School, Sandford School, Chetwynd district schools. 2007, June - featuring "The Albion Revisited", Henty School in the 1930s, Sandford in WW2. 2007, May - featuring the GRANT family "The GRANTs, a short history". 2007, April - featuring the The Western Front in WW1, Vern McCallum Photographic Collection, "The Changes in Time" Des Murphy (Part 15). 2007, March - featuring "The Casterton Theatre", "The Changes in Time" Des Murphy (Part 14), the Sandford Hotels, Casterton Old Cemetery, People of Merino. 2007, February - featuring "Soldier Settlement at Carapook, "The Changes in Time" Des Murphy (Part 13), "Back-to-Sandford". 2006, November - featuring Casterton Christmas Lights, Merino Township Settlers, "The Changes in Time" Des Murphy (Part 12). 2006, October - featuring "Glenleg Inn" 100th Anniversary, John RICHARDSON's Golden wedding photograph in 1901. Click this link to download an amended copy of the photograph with the correct names in reference to a photograph in the newsletter which is incorrect. 2006, September - featuring "Physician Heal Thyself", Sandford Timeline, "The Changes in Time" Des Murphy (Part 11). 2006, August - featuring "People of Casterton" William SHIELS (Pt 2), "The Changes in Time" Des Murphy (Part 10), Digby Timeline, Transportation in the Casterton district, "Helen McPherson SCHUTT - Philanthropist 1874-1951" (Pt 4). 2006, July - featuring "July 1906 - Floods! ", "July 2006 - Praying for Rain (but not floods! )", "People of Casterton" William SHIELS (Pt 1), "The Early History of Sandford", "Naming of Casterton", "Helen McPherson SCHUTT - Philanthropist 1874-1951" (Pt 3). 2006, June - featuring "The Contribution of the HENTYs", "Helen McPherson SCHUTT - Philanthropist 1874-1951" (Pt 2), "The Changes in Time" Des Murphy (Part 10), "A Flash in the Sky". 2006, May - featuring "The WAINES Murder" (Pt 5), "Memories" (Pt 2), "The Changes in Time" Des Murphy (Part 9), "About the HENTYs", "Helen McPherson SCHUTT - Philanthropist 1874-1951" (Pt 1). 2006, April - featuring Anzac Day & Gallipoli, "Tom CUE" by Jim Foster, "Memories" (Pt 1), the origin of Casterton, "The Changes in Time" Des Murphy (Part 8), "The WAINES Murder" (Pt 4). 2006, March - featuring "Indian Hawkers" 1891, Casterton thoroughfares, "The Changes in Time" Des Murphy (Part 7), "The WAINES Murder" (Pt 3). 2006, February - featuring Dr Charles SMITH & his house, Casterton thoroughfares, Hawkers in Australia. 2005, November - featuring "A History of Christmas", "The WAINES Murder" (Pt 3), Casterton Street Names (Pt 1), "The Changes in Time" Des Murphy (Part 7), "Casterton Railway & Station Masters", "J. R. MacPHERSON Esq. ", Casterton Street Names (Pt 2). 2005, October - featuring "Casterton Photographers", "The Changes in Time" Des Murphy (Part 6), "The WAINES Murder" (Pt 2), Casterton Street Names. 2005, September - featuring "The WAINES Murder" (Pt 1), "The Changes in Time" Des Murphy (Part 6), Casterton Street Names, "Extracts from the Minutes". 2005, August - featuring "Georgia and Rebecca McClellan go to England", Casterton Street Names, "The Changes in Time" Des Murphy (Part 5), Edward HENTY. 2005, July - featuring "History of the Postal Services in Casterton and Strathdownie", Casterton Street Names, "The Changes in Time" Des Murphy (Part 4), "John 'Jack The Shingler' Richardson", "Brief History of the Casterton Railway and Minnie Hole" by John Cleary, . 2005, June - featuring "The History of the Casterton Racing Club Inc.", "Dergholm", "The Changes in Time" Des Murphy (Part 3), Casterton Street Names. 2005, May - featuring Casterton Street Names, "The Four Castertons", "The Changes in Time" Des Murphy (Part 2), "The History of May Day", "Bahgallah", "Harpfields to Wando Vale". 2005, April - featuring Casterton Street Names, "Gallipoli", "The Changes in Time" Des Murphy (Part 1). 2005, March - featuring "Extracts from the 1966 Minutes", "A History of St Patrick's Day".